Safety Cone really loves ear flap hats (see my other listings), but he's willing to put away the winter wear if an equally fun hat is put in its place. It's Viking Safety Cone! In honor of my dear Danish friend's move back to Denmark, Safety Cone decided to get in the Scandinavian mood and don a cute little viking hat with horns. 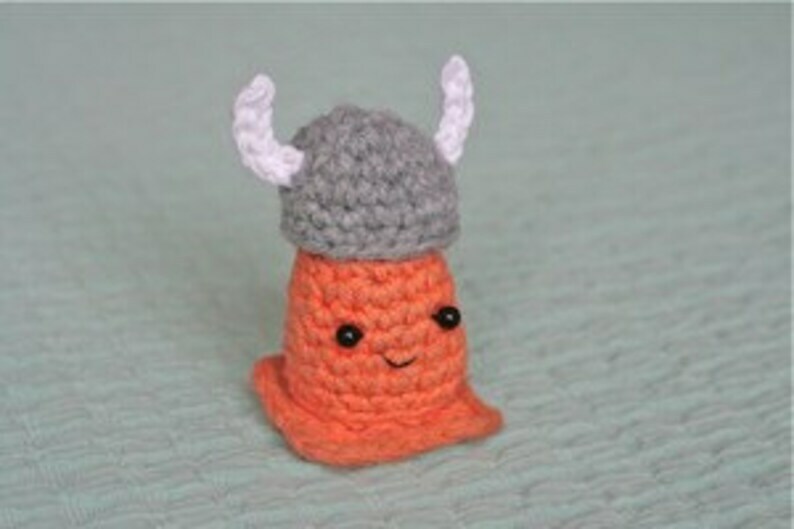 Safety Cone and his viking hat are both crocheted: Safety Cone is made from orange cotton yarn, and the hat is made from soft gray wool and white cotton yarns. The hat comes right off, so he can go back to being regular Safety Cone any time he wants. So adorable! I bought this as a gift, but I think my sister is going to love it as well. I accept Paypal, and under some circumstances, USPS money orders. I ship USPS First Class, unless otherwise stated. If you need something faster (Priority, Express), please notify me BEFORE purchasing and I will update the shipping cost for you. All of my crochet items are my original designs. If you purchase a crochet pattern, please only use for personal use and do not sell any items made.